September is upon us, and September is the peak month for hurricane activity in the North Atlantic. (See the NOAA Hurricane Climatology graph via Wikipedia.) 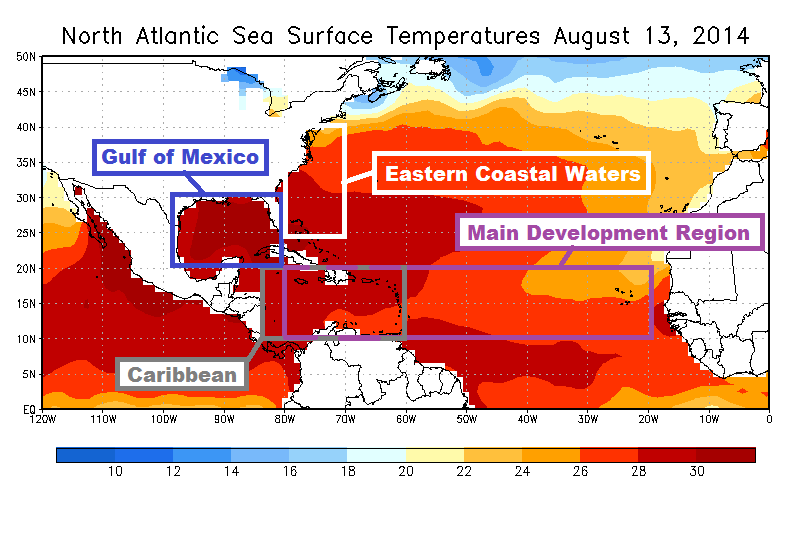 So, to check the temperature conditions leading up to the peak month, let’s take a look at the August 2018 sea surface temperatures anomalies and sea surface temperatures for the hurricane development regions—Main Development Region (10N-20N, 80W-20W), Caribbean (10N-20N, 86W-60W), and Gulf of Mexico (21N-31N, 98W-81W)—along with those of the waters along the east coast of the United States (24N-40N, 80W-70W). For the geographically impaired, see the map here for the locations of those regions. 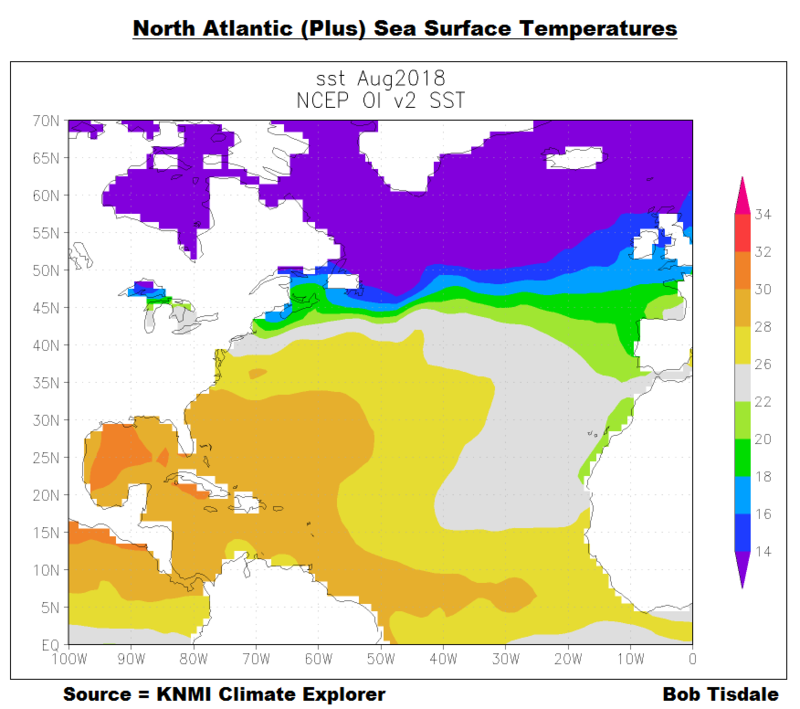 Figure 1 is a map of August 2018 sea surface temperature anomalies for the entire North Atlantic, plus a small portion of the East Pacific. It was created at the KNMI Climate Explorer using NOAA’s Reynolds OI.v2 sea surface temperature data available there. Reynolds OI.v2 is also the dataset used for the graphs that follow. 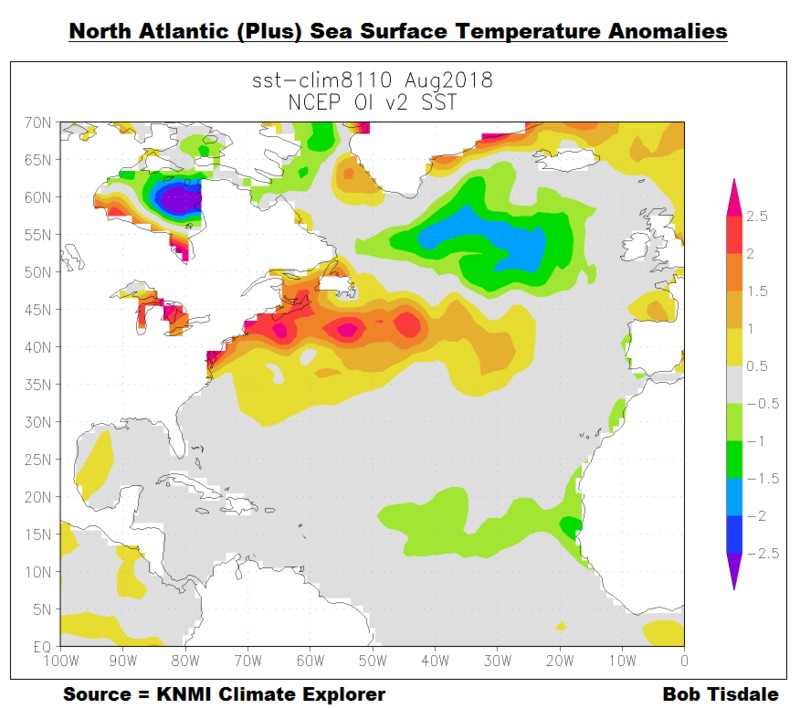 August was still showing lower-than-normal temperature anomalies in the North Atlantic at high latitudes and in the tropics, along with a region of elevated anomalies at mid latitudes. That spatial pattern is known as a tripole. There are of course some knuckleheads out there who will focus on the warm water at mid latitudes of the North Atlantic, claiming that Florence was made worse by it, and I suspect they’ll use the word unprecedented lots of times. 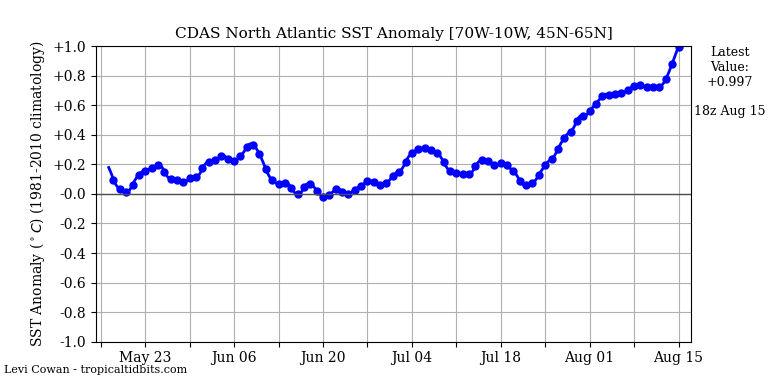 To combat that alarmist trash, I posted the sea surface temperatures for the warmer-than-normal pool in the North Atlantic in a post on Sunday. See the post Sea Surface Temperature Anomalies of the Patch of Warmer-Than-Normal Waters in the North Atlantic. The cross post at WattsUpWithThat is here. The overly adjusted NOAA ERSST.v5 data show that the sea surfaces in that warmer-than-normal spot were comparably warm, if not warmer in the 1860s, 1930s and 1950s. 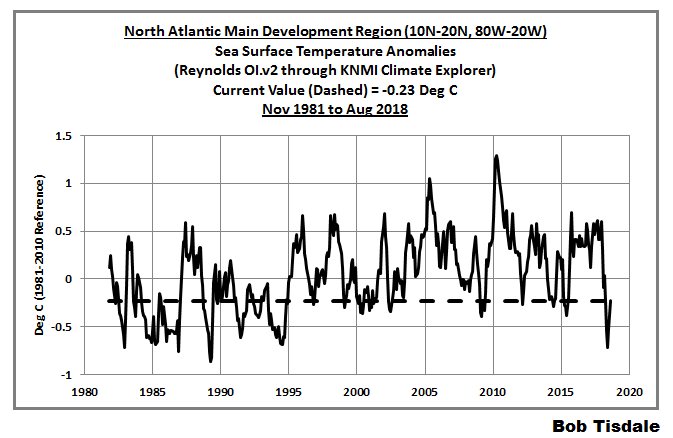 And for those interested, Figure 2 presents a graph of the sea surface temperature anomalies for the entire North Atlantic (0-70N, 80W-0) from November 1981 to August 2018, which is the full term of the Reynolds OI.v2 sea surface temperature data. 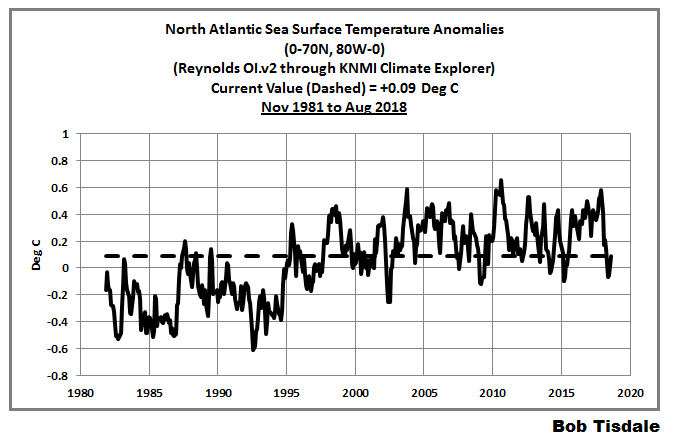 As you can see, while the sea surface temperature anomalies are slightly higher than normal (+0.09 deg C) with reference to the base years of 1981 to 2010, there’s nothing unusual about those values. Positive anomalies of that minor magnitude, and anomalies that are much greater, are achieved regularly. The sea surface temperature data used in this post is the original (weekly/monthly, 1-deg spatial resolution) version of NOAA’s Optimum Interpolation (OI) Sea Surface Temperature (SST) v2 (aka Reynolds OI.v2). It is available through the KNMI Climate Explorer via their Monthly Observations webpage (Thanks, Geert Jan!). Figure 3 shows the sea surface temperature anomaly data for the Main Development Region, a.k.a. MDR, (10N-20N, 80W-20W). The August 2018 MDR sea surface temperature anomaly was -0.23 deg C, slightly lower than normal. Sea surface temperature anomalies of that level occur fairly regularly there. 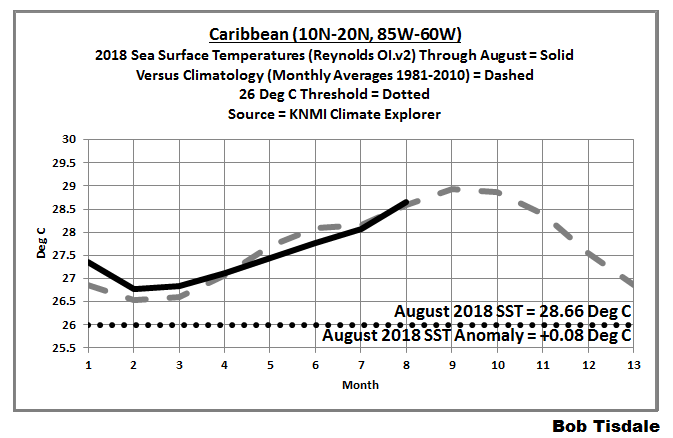 For the western portion of that region, the sea surface temperature anomalies of the Caribbean (10N-20N, 86W-60W) were slightly elevated for August (+0.08 deg C), as shown in Figure 4, but that’s nothing unusual, considering the volatility there. 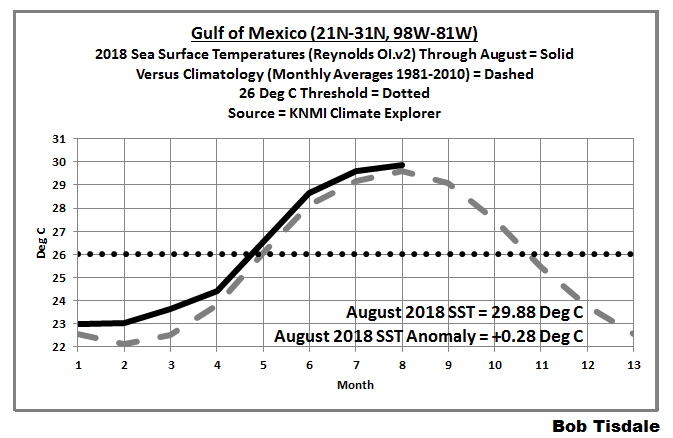 A little farther north and closer to U.S. shores, Figure 5 shows that the sea surface temperature anomalies of +0.28 deg C for the Gulf of Mexico (21N-31N, 98W-81W) were also slightly higher than average (the average for 1981 to 2010) in August 2018, which is also not unusual. 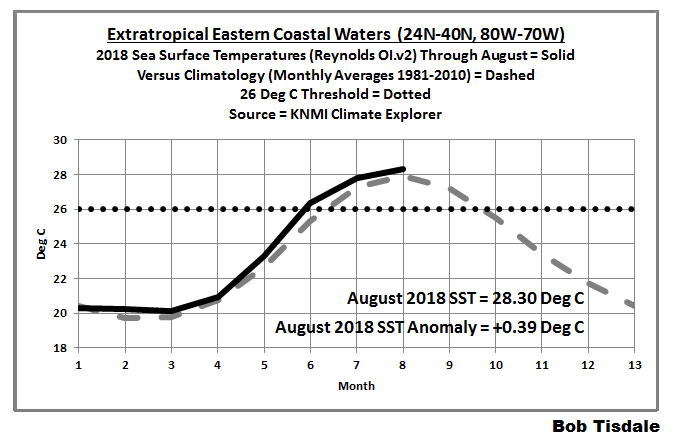 And for those interested in the sea surface temperature anomalies along the east coast of the U.S. (24N-40N, 80W-70W), which captures the extratropical portion of Hurricane/Post Tropical Storm Sandy’s track, Figure 6 shows that temperature anomalies for August were elevated there as well (+0.39 deg C), and once again, there’s nothing unusually high about them. In other words, they definitely are NOT unprecedented. 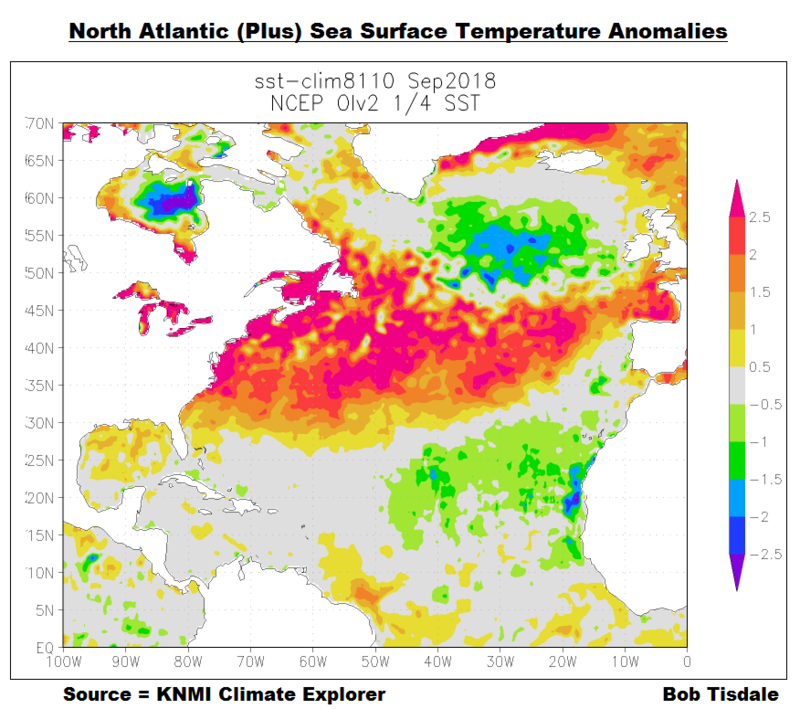 For those looking for more detail—that is, daily sea surface temperature anomaly graphs for the MDR, the Caribbean and the Gulf of Mexico—see Levi Cowan’s Ocean Analysis webpage at TropicalTidbits. There’s a drop-down menu toward the bottom of the page so you can select the graph of daily sea surface temperature anomalies for the region of your choice over what appears to be the last 3 months or so. Sea surface temperatures of 26 deg C or higher are considered necessary for the development and sustainability of hurricanes. Unfortunately, the temperature anomaly graphs above don’t tell us what the actual temperatures are. Anomalies are simply the deviation from the normal, where normal is the average for the month in question for a 30-year (or longer) period. 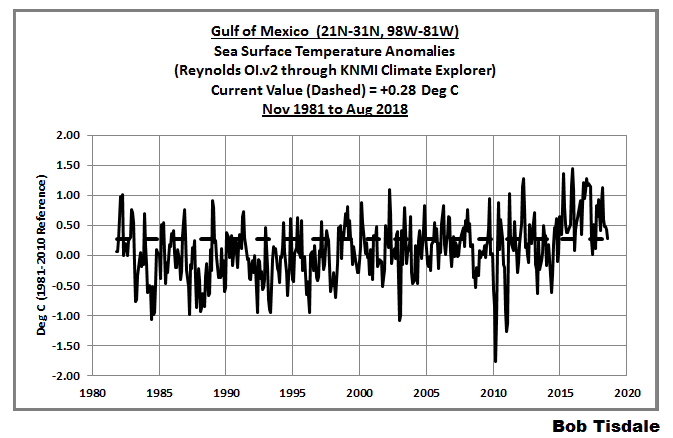 I used 1981 to 2010 as the base years for anomalies in the graphs above, which is consistent with NOAA practices for many datasets (other than global temperatures). 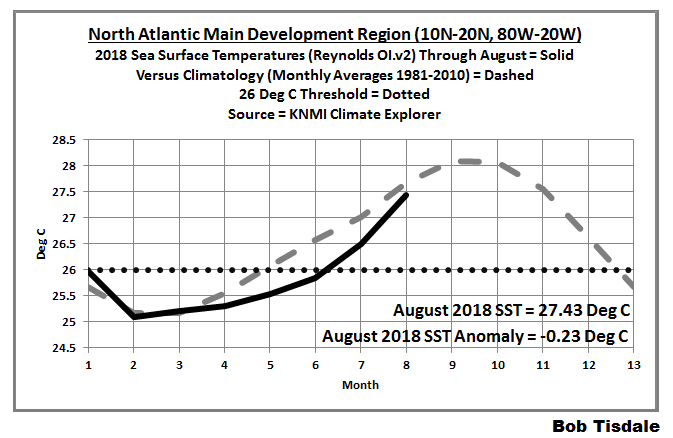 Figure 7 is a map of the North Atlantic sea surface temperatures (not anomalies) for August 2018. As illustrated, with the exception of the northeast portion of the Main Development Region (MDR = 10N-20N, 80W-20W), the sea surface temperatures in all of the hurricane development regions are above the 26 deg C threshold. No surprise there. Figures 8 through 11 are graphs that show (dashed grey lines) the average annual cycles in the sea surface temperatures for the 4 hurricane development regions based on the average monthly sea surface temperatures for the base years of 1981 to 2010. Also shown are the respective 2018 sea surface temperatures (solid lines), and the 26 deg C threshold (dotted horizontal lines). As shown, the sea surface temperatures are well above the 26 deg C threshold in all regions. Whether they stay there will depend on the weather, of course. 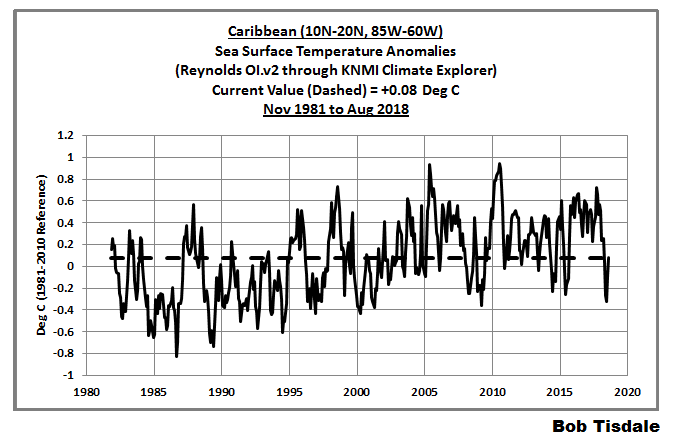 Something should be real obvious when looking at the annual cycle of the sea surface temperatures for the Caribbean, where the sea surface temperatures are above the 26 deg C threshold temperature for hurricane development all year long. And that thing that should be really obvious is, conditions other than warm sea surfaces are also required for hurricanes to develop. Otherwise hurricanes would be forming in the Caribbean all year round. Speaking of Dad, Is Climate Getting Worse in the United States?, in it, I presented graphs of the annual cycles in sea surface temperatures for the hurricane development regions (Main Development Region, Caribbean and Gulf of Mexico) for model-data comparisons. 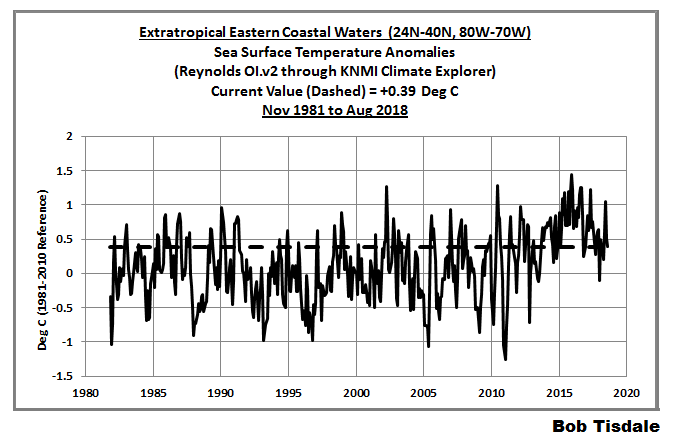 That way we could see that the sea surface temperatures were too cool in the average of the climate models used by the IPCC for their propaganda-necessary projections, and because they were too cool (by as much as 1 deg C), any modeled hurricane seasons would be too short. This was another way to show why climate models need to properly simulate Earth’s absolute temperatures, which we know they do not do. To make things even worse, the temperature differences between models and data were not consistent from region to region, which was yet another way to show that ocean circulation in the models is flawed. These are likely a few of the reasons why specially programmed climate models, NOT the CMIP5 models used for doom-and-gloom projections, are used to study hurricanes in the future. The primary intent of Dad, Is Climate Getting Worse in the United States? was to present U.S. government-furnished data (readily available online to the public) that show that weather events—hurricanes making landfall on the continental U.S., tornados, drought conditions, floods, wildfire acreage, and heatwaves and cold spells—have NOT become more frequent or extreme for the United States. And to further confirm that climate models are not simulating Earth’s climate, that ebook also includes sea surface temperature (not anomalies) model-data comparisons (for the period of 1982 to 2017) globally and for the Northern and Southern Hemispheres, and for the individual ocean basins (full basin and for their Northern and Southern hemisphere portions). Those graphs are basically updates (through 2017) of many of the graphs shown in the 2016 blog post Climate Models Are Not Simulating Earth’s Climate – Part 2 (WattsUpWithThat cross post is here), excluding the breakdowns of tropics versus extratropics. If Florence or another hurricane makes landfall on the U.S. this season, I suspect I’ll provide a post showing actual sea surface temperature data for the storm track to combat the normal global warming/climate change alarmist bullshite. 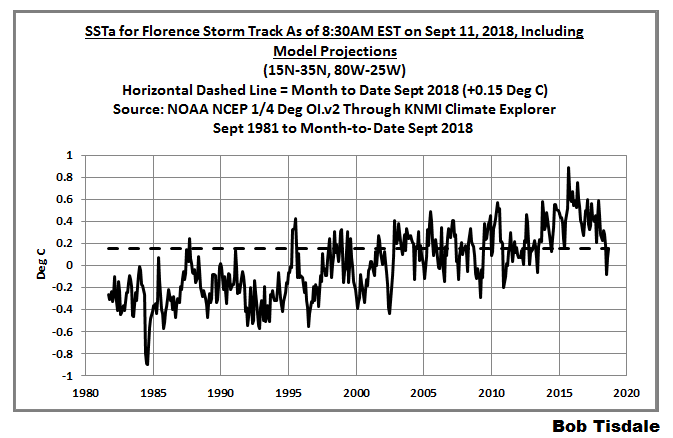 But for Florence that would have to wait until the September sea surface temperature data are published early in October. This entry was posted in Hurricanes, SST Update. Bookmark the permalink. Nick, the KNMI Climate Explorer also has NOAA NCEP ¼ deg resolution SST data which is available through September 2018 month to date. There’s nothing unusual about the SSTa for the entire storm track. Why didn’t I use that dataset for the post, you might ask? It’s preliminary monthly data based on daily data, and therefore questionable! The data you supply is within past Earth’s climates; as you have stated. While the data you supplied is good to know; the data has no significance outside of planetary norms over the last 4 plus billion years of Earth. Why is preliminary monthly data questionable? A trend line next to or included on top of the graphs would be a really good idea to see what is happening. One could compare the same time period of several to numerous past storms during the same time period in the storm for comparison to try and find something significant. Terry, thanks for the thoughts. But the intent of the post was to help combat the normal alarmist BS. That’s all I have time for.